There is no point in convincing people that are not willing to improve and learn. Even if you manage to win one argument and squeeze in NHibernate, for example, they may end up writing the same tightly coupled, untestable, data-or-linq-oriented code as they did before. DDD is hard and it will require changing a lot of assumptions, hurt egos etc. Depending on the size of the company it may be a constant battle that is not worth starting. #103 Quetzal Bradley on Testing after Unit Tests - extremely interesting, giving deep insight into how to think about the purpose of coverage metrics etc. J.B. Rainsberger: "Integration Tests Are A Scam" is a recording of a presentation covering integration vs unit tests. It’s Not TDD, It’s Design By Example - Brad Wilson, similar in vein to HC #42, attempting to get across why you're writing the tests. I know you didn't ask for books but... Can I also mention that Beck's TDD book is a must read, even though it may seem like a dated beginner book on first flick through (and Working Effectively with Legacy Code by Michael C. Feathers of course is the bible). Also, I'd append Martin(& Martin)'s Agile Principles, Patterns & Techniques as really helping in this regard. In this space (concise/distilled info on testing) also is the excellent Foundations of programming ebook. Goob books on testing I've read are The Art of Unit Testing and xUnit Test Patterns. The latter is an important antidote to the first as it is much more measured than Roy's book is very opinionated and offers a lot of unqualified 'facts' without properly going through the various options. Definitely recommend reading both books though. AOUT is very readable and gets you thinking, though it chooses specific [debatable] technologies; xUTP is in depth and neutral and really helps solidify your understanding. I read Pragmatic Unit Testing in C# with NUnit afterwards. It's good and balanced though slightly dated (it mentions RhinoMocks as a sidebar and doesnt mention Moq) - even if nothing is actually incorrect. An updated version of it would be a hands-down recommendation. More recently I've re-read the Feathers book, which is timeless to a degree and covers important ground. However it's a more 'how, for 50 different wheres' in nature. It's definitely a must read though. 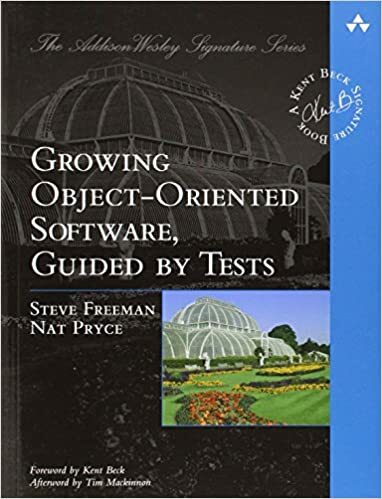 Most recently, I'm reading the excellent Growing Object-Oriented Software, Guided by Tests by Steve Freeman and Nat Pryce. I can't recommend it highly enough - it really ties everything together from big to small in terms of where TDD fits, and various levels of testing within a software architecture. While I'm throwing the kitchen sink in, Evans's DDD book is important too in terms of seeing the value of building things incrementally with maniacal refactoring in order to end up in a better place. It is always tricky to get a project off the ground using TDD if you have never done it before, and it is too big a topic to discuss in a Stack Overflow answer. The best I can recommend is to read Growing Object Oriented Software Guided by Tests - in this book you are taken step by step through getting an application off the ground using TDD, and examples of how you would solve different problems using TDD as the application grows. The application they use as an example in the book is realistic and should help you learn the skills required to get yourself off the ground. For example you can use 'Per Class' approach for classes that are relatively small and follow SRP. But if you have legacy code with a giant *Manager class it is fine to use 'Per Method' and have dedicated test case for only one of its methods. I think that choosing naming strategy for tests is at least as important as test code organization. Using code coverage tool can help you find spots of untested code. It is less useful as metric. Having high code coverage does not necessarily mean that you have good tests. At the end of the day what matters is that you have meaningful and readable tests. AF will do the right thing (User.Create() with an anonymous name arg) with no customizations whatsoever. Perhaps you could consider exposing a ctor that takes an id too. Then you can do a Customize<User> ... GreedyConstructorQuery. Regarding mixing mocking and feeding in of values to an Entity or Value object - Don't do that (Mark Seemann's Commands vs Queries article might help you here). The fact that you seem to be needing/wanting to do so makes it seems you're trying to be too ambitions in individual tests - are you finding the simplest thing to test and trying to have a single Assert testing one thing with minimal setup. Go buy the GOOS book - it'll help you figure out ways of balancing these kinds of trade-offs. Nope, there's no way around it. Tests are not easy. But! Writing tests, learning from that, then improving your tests, which in turn help you design better software will make writing tests easier. And will help you write better code, in general. Also, 99% of the time, the first test you are going to write in a job is for an existing piece of software. So it will definitely not be easy. But you will learn so much more about the software you are writing the test against rather than writing code in the edit-and-pray methodology. As a start, I recommend reading "Growing Object-Oriented Software, Guided by Tests". I am still not a 100% convert but I did get many of the same questions answered. I try to setup a feedback loop as soon as possible. I spend time setting up so i can do some simple action (hit a button, run a command, or automatically watch some files) to see if I'm on target it. I found this saves immense time and keeps me on task pretty well.